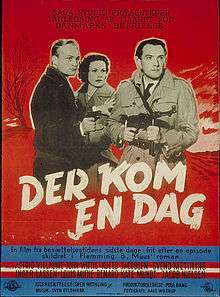 Der kom en dag (English: There Came One Day) is a 1955 Danish dramatic film directed by Sven Methling and produced by John Olsen at Saga Studio. Co-written by Olsen and Flemming B. Muus, the film was based on a true story as told in Muus' novel of the same name. The movie starred John Wittig, Kjeld Jacobsen and Astrid Villaume as Danish resistance fighters during the last days of the German occupation of Denmark in World War II. It won the 1955 Bodil Award for Best Danish Film (in a tie with Carl Th. Dreyer's Ordet).